Classic Tim Rogers Band Concert Posters and Memorabilia! Buy Online Now! Tim Rogers is best known as the guitarist, singer, and primary songwriter of the Australian rock band You Am I, who were the poster boys of alternative rock within Australia during the ’90s, though largely unknown overseas. The elegantly wasted Rogers also became known for his roguishly charming persona and rock star antics to rival Ryan Adams both on and off the stage. Rogers was born in Kalgoorlie, Western Australia, in 1968, although he moved several times in his youth. 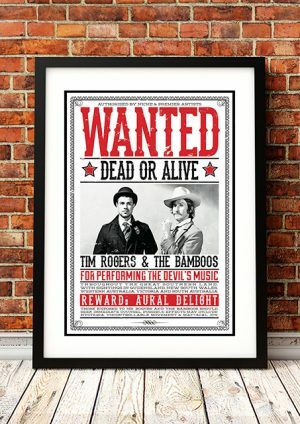 His older brother had a collection of imported American records, which Rogers would break into his room to listen to while he was out. The first lineup of You Am I consisted of Rogers, his brother Jaimme (the initial frontman), and a school friend of theirs. While living in the city of Canberra and studying law and arts, Rogers met Andy Kent, who became You Am I’s sound mixer. After a fight between the Rogers brothers, the lineup changed completely and Kent was invited to play bass. You Am I went on to win many Australian fans in the ’90s, releasing three albums in a row, all of which debuted at number one. Rogers is said to keep all of their trophies in his outdoor toilet. 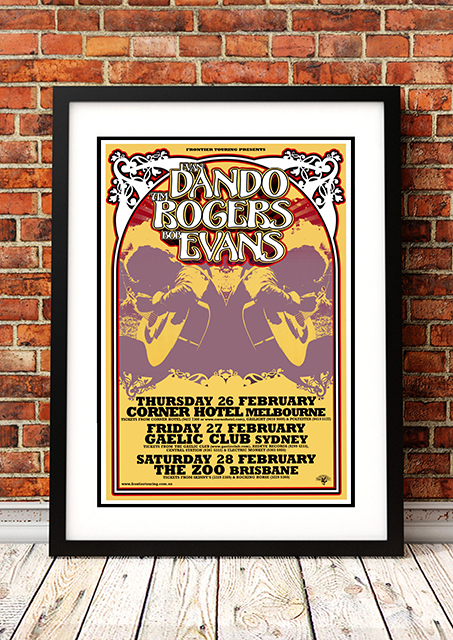 We stock some awesome Tim Rogers Band Concert Posters.